ORMA - Owen Racing Motor Association. Homepage. This page: A compliments slip given away by the O.R.M.A. motor racing supporters' club of the 1950s and 1960s. O.R.M.A. and the BRM Supporters' Association. 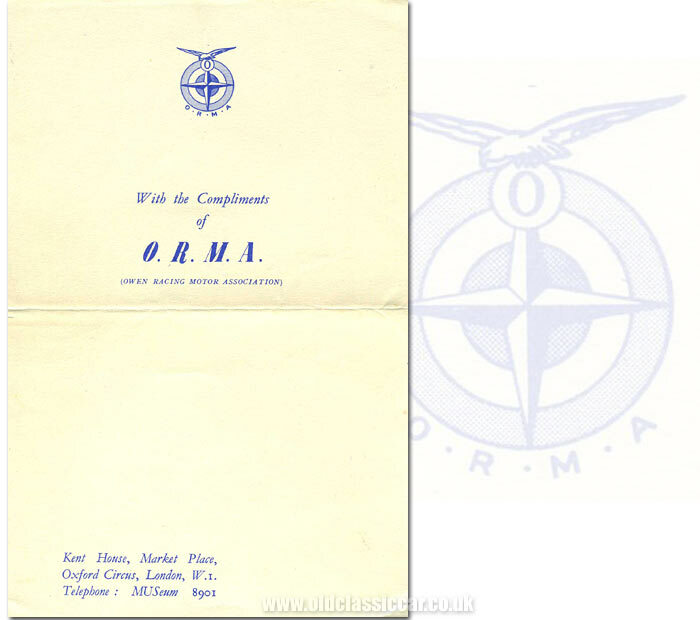 Shown below is a compliments slip issued by the ORMA motor racing enthusiasts' club from their headquarters at Kent House in Oxford Circus, London W1. ORMA stood for the Owen Racing Motor Association. Rubery Owen was, in 1949, one of the many companies involved with Raymond Mays and the BRM (British Racing Motors) Grand Prix racing team, later taking a majority share of the team and sharing in their highs and lows throughout the 1950s and 1960s. In the early days of the team, the BRM supporters' Association provided a framework to pull together the many supporting individuals and organisations behind the ambitious plan to create a world-beating Grand Prix team in Britain, with the V16 BRM being the high-profile, if largely unsuccessful, focus of the programme in the early years. Following the many problems that beset the V16 project, the Owen Organisation took over the rights to the team and the BRMA became the ORMA, providing enthusiastic supporters of BRM's activities with regular newsletters and opportunities to visit the Works, view film shows, and meet the drivers. It wouldn't be until 1959 that the BRM team secured its first Grand Prix win, in the hands of Jo Bonnier driving a BRM P25 at Zandvoort. 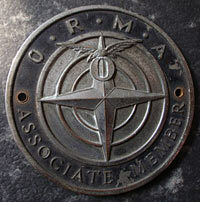 Members of the ORMA could also buy memorabilia relating to the Association, including a members' lapel badge, and also an enamel car badge, an example of which appeared some time ago on the oldclassiccar forum, and is shown below. I might look into buying one of these if I see one on my travels. I'd also like to find a copy of a 78rpm record issued by the ORMA titled "Noise of the BRM" - a picture of which receives a mention on the car records page. Other unusual items similar to this compliments slip can be found in the Motoring Collectables section of the site.